Transon Industriy Co., Ltd. was established in 1980 and specialized in sock manufacturingand hosiery manufacturer. We focus on creating value for customers by providing outstanding technical and manufacturing services. All socks of we produces are designed well. 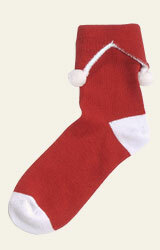 High quality socks made of cotton, acrylic, nylon, and spandex, etc. are comfortable and warming for wearing. The size, colors and lengths of the socks are available, and we also can make the specific design that customer’s indicated. We have experienced strong growth by being a true partner with our customers and strong designing and developing ability. We can develop OEM products from customer drawings, photos and samples. Our trained QC teams follow strict quality control procedures. All finish products then undergo final inspection and check for logos, labels and design faults. If you are interested in our sock manufacturing products or have any further inquiries, please feel free to contact us, enjoy browsing our website! Gokak Mills places a high premium on employee welfare. The company hospital, residential complex, educational institutions are one of the best in the region. More than half the company’s employees were born and educated at these facilities.